First post here. I have been holding back form posting because I wanted to wait until Project Gandalf the Grey has been finished. But it looks like its going to take a little longer than expected. I already promised the shops that have done work on my vehicle that I would be posting soon. See below for pics and details. Custom Tow Hitch performed by Jesse from Precision Trailer Hitch and Welding. If you are in the SoCal area, do yourself a favor and visit Jesse or Justin at Precision Trailer Hitch in Sun Valley, CA. They are extremely skilled at what they do, creative, smart, and honest. I have recommended many friends and family to them because I had such an excellent experience. 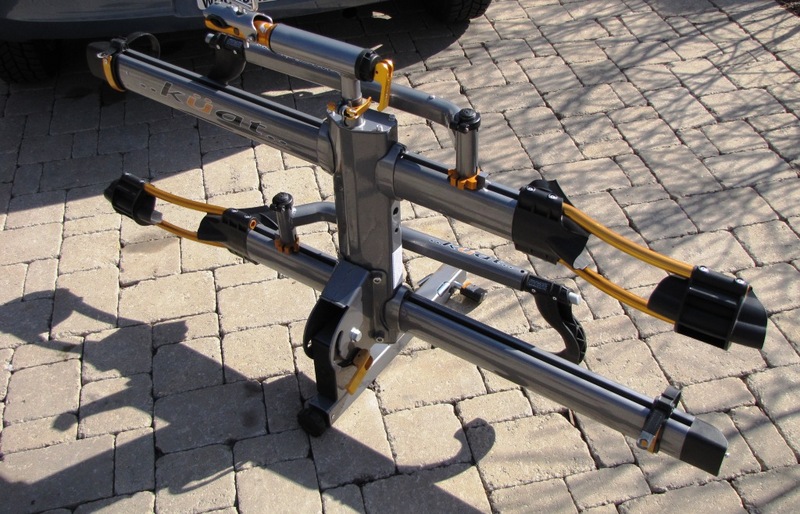 Make sure to bring your bike carrier, cargo carrier or whatever you plan on connecting to your hitch so they can take proper measurements and custom fit it to your preference. I also highly recommend making an appointment or calling ahead to see if they can fit you in for the same day. They get booked pretty fast. For Gandalf, i had them weld a 2" hitch and custom fit it to work with my Kuat NV bike hitch carrier. They cut into the plastic trim with precision toincrease the height because of the design on the Kuat NV carrier. The tightening knob was under the carrier so it would scrape almost every driveway. The cut gave me approximately just enough of a height increase to clear most driveways. I flinched a little when they offered to cut it, but they did a good job of cutting it with precision. It looks stock. Mention that you are from the Ford Cmax Forums and was recommended by Enrique or Ej. Excellent! I'm looking for a high capacity hitch to carry either a cargo box or an electric wheelchair (with lift). It needs to be 2" to be compatible with what I already have. The only 2" hitch available doesn't have as much strength as the Curt 1-1/4 hitch so I've been looking for a welding shop who can modify the Curt to be 2". So far no luck. Now I'm jealous of your hitch especially the extra ground clearance! How many bolts attach it to the frame? Cost? Pictures from below? If theyre open tomorrow, ill get the answers for you. As far as cost, i believe they charged me $220 but ill make sure to ask as well. Ill try to get more photos as well. I also have a little more clearance now because i upsized my wheels to 18". So now the knob on my bike carrier doesnt scrape my driveway. Yes i've seen the Torquelift but it only has a 200 Pound rating. That's plenty for bike racks etc but a wheelchair lift weighs 100 pounds then add the wheelchair with batteries and I'm quickly over 200. Wasn't crazy about the price either. For $265 + installation I "should" be able to get a custom hitch like the OP or have a Curt modified. I can get the Curt for $120 delivered. Edited by eldrijt, 21 March 2015 - 06:03 PM. Upsizing the wheels shouldn't have provided more ground clearance? The larger rims should have a narrower rubber, or your speedometer would be all over the place (reading too low). Plus, there isn't a whole lot of clearance in the wheel wells anyway (hence the reason the C-Max cannot use snow chains). You're right. Sorry about the confusion. I realized the reason why it scraped before was because it was loaded with a mountain bike and road bike which lowered the height of the carrier. It caused the knob to scrape on the driveway. I recently had two lightweight road bikes on the bike and the weight didn't cause the knob to scrape. Sorry for the delay. I have been busy and completely forgot to called Precision Tow. I will try again this morning right after class when they are open. So I got in touch with Precision Tow. This is a fully welded hitch. There are no bolts so I don't have to worry about torquing the bolts once in awhile. Oh wow fully welded sounds great! I just found a shop to weld/upgrade the Curt to 2". if I was near your guy I'd be there tomorrow!